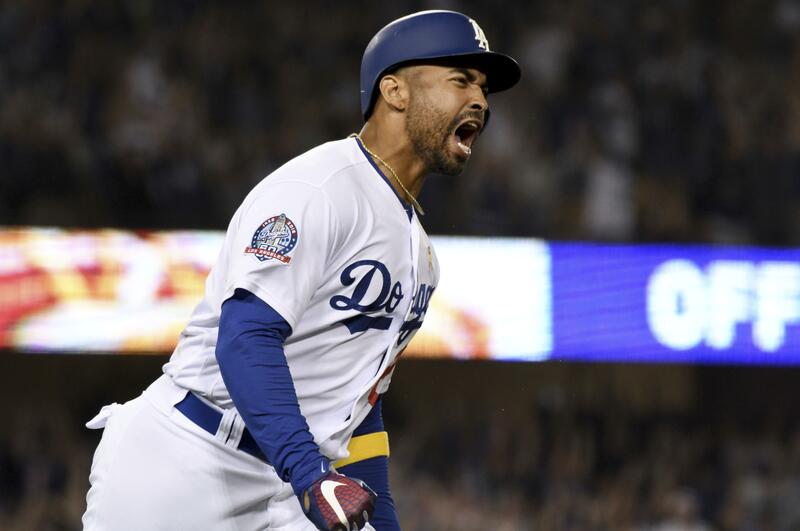 UPDATED: Sat., Sept. 1, 2018, 10:14 p.m.
Matt Kemp slugged a go-ahead, two-strike, three-run homer in the eighth inning, lifting the Los Angeles Dodgers to a 3-2 victory over Arizona and a tie atop the N.L. West with the Diamondbacks on Saturday night in Los Angeles. With fans on their feet chanting “Let’s go Dodgers,” Kemp took two quick strikes from Archie Bradley before launching his 19th homer into center field for a 3-2 lead. Justin Turner got the rally going with one out in the inning. He singled for the Dodgers’ first hit since his double in the third. Manny Machado followed with a 10-pitch walk by Bradley to set up Kemp. Bradley (4-5) was leading the National League in holds with 31 before Kemp’s homer. Kenta Maeda (8-8) worked a perfect eighth. Kenley Jansen put the tying run on in the ninth. The All-Star closer gave up a two-out double to Nick Ahmed before Ketel Marte popped up to second, giving Jansen his 34th save in 38 opportunities. Cubs 7, Phillies 1: Kyle Hendricks pitched six strong innings, Javier Baez notched his N.L.-leading 99th RBI and Kris Bryant doubled and had two hits in his return from the disabled list to lead the Chicago past the Phillies in Philadelphia. Ian Happ homered and Baez had three hits for the N.L. Central-leading Cubs, who have won nine of 11. Bryant had been sidelined since July 23 with left shoulder inflammation. The 2016 N.L. MVP doubled and scored in the third and singled in the eighth. Hendricks (11-10), a former Spokane Indian, allowed one run on six hits with four strikeouts and two walks. Yankees 2, Tigers 1: Masahiro Tanaka pitched seven strong innings for his first win since July, rookie Gleyber Torres hit a two-run homer and the Yankees beat Detroit in New York. The Yankees got only two hits, but won for the 11th time in 15 games. New York has the second-best record in the majors, behind A.L. East-leading Boston. Tanaka gave up one run and seven hits for his first victory since July 31. He was 0-3 with a 4.40 ERA in five August starts. Astros 7, Angels 3: Tyler White hit a go-ahead two-run double in a five-run eighth inning, Alex Bregman homered and the Astros beat Los Angeles in Houston. With the score tied in the eighth, White hit a pitch to left field off Hansel Robles that missed being a home run by just feet. The ball bounced off the top of the metal scoreboard and back into left field. George Springer and Carlos Correa came around to score, putting the Astros ahead 5-3. Mariners 8, Athletics 7: James Paxton returned from the disabled list to strike out 10 batters over five innings, Ben Gamel hit a two-run double, and Seattle held off the Athletics in Oakland, California. Jean Segura had a two-run single in the fifth, an inning after he was hit by a pitch. He finished with three hits, helping Seattle pull within 4 1/2 games of Oakland for the second A.L. wild card. Rockies 4, Padres 2: D.J. LeMahieu homered and Jon Gray pitched six solid innings as Colorado snapped San Diego’s season-high four-game winning streak, defeating the Padres in San Diego. The Rockies broke a 21-inning scoreless string with a three-run fourth when they strung together four straight hits, the biggest one being LeMahieu’s 13th homer. Nationals 5, Brewers 4: Juan Soto’s two-run single highlighted a four-run eighth inning and the Nationals rallied past Milwaukee in Washington. With Washington trailing 3-1 in the eighth, Adam Eaton capped a nine-pitch at-bat with a two-out double off Joakim Soria. Trea Turner then lofted a single to left to make it 3-2. After Turner stole second Bryce Harper and Anthony Rendon walked to load the bases. Milwaukee’s Dan Jennings came on to face Soto, who singled up the middle on a 2-2 pitch, scoring Turner and Harper with his third hit of the night. Rendon then scored on a wild pitch by Jordan Lyles. Washington’s Greg Holland retired Manny Pina with the bases loaded to end the eighth and Justin Miller survived Tyler Saladino’s pinch-hit solo homer in the ninth for his second save. Red Sox 6, White Sox 1: Eduardo Rodriguez struck out 12 in 5 2/3 innings in his return from an ankle injury, leading Boston past the White Sox in Chicago. Jackie Bradley Jr., Ian Kinsler and Eduardo Nunez homered as A.L. East-leading Boston maintained its 7 1/2-game lead over the New York Yankees. The Red Sox won for the fourth time in five games to run the majors’ best record to 94-43, already one more victory than they had when they won the division each of the past two years. Rays 5, Indians 3: Blake Snell moved into a tie for the major league lead with his 17th win as Tampa Bay beat the Indians in Cleveland. Snell allowed two runs in 6 2/3 innings, giving up both runs in the second with one being unearned thanks to a throwing error by third baseman Matt Duffy. The left-hander worked around trouble early in the game, but retired nine of the last 10 hitters he faced and struck out the side in the sixth. Snell is tied with New York’s Luis Severino and Cleveland’s Corey Kluber – two other top candidates for the A.L. Cy Young Award – for the most wins in the majors. Braves 5, Pirates 3: Freddie Freeman hit a tiebreaking, RBI double in the four-run eighth inning, and N.L. East-leading Atlanta rallied to snap a three-game skid and beat visiting Pittsburgh. The Braves increased their division lead to three games over Philadelphia. They had dropped five of six overall and seven of eight at home. Mets 2, Giants 1 (11): Steven Matz struck out a career-high 11 batters, and New York went on to beat the Giants in San Francisco. Wilmer Flores doubled to left off Giants reliever Hunter Strickland (3-4) to lead off the 11th. He went to third when Jay Bruce grounded out to second against the shift, and scored on Todd Frazier’s fly ball to left. Reds 4, Cardinals 0: Luis Castillo and two relievers combined on a two-hitter to lead Cincinnati past the Cardinals in St. Louis. The Reds snapped a three-game losing streak. St. Louis, which won a major league-best 22 games in August, lost for the second time in six games. The Cardinals fell 4 1/2 games behind Chicago in the N.L. Central. Rangers 7, Twins 4: Adrian Beltre hit his 470th career homer after 23-year-old sluggers Nomar Mazara and Ronald Guzman went deep, helping the Texas stop a five-game losing streak with a win over Minnesota in Arlington, Texas. Royals 5, Orioles 4: Whit Merrifield hit a two-run homer with one out in the ninth inning, giving Kansas City a back-and-forth victory over Baltimore in Kansas City, Missouri. Kansas City has won six of seven on its homestand, its best seven-game stretch since July 2017, including the first two of this three-game series between the worst teams in the majors. Marlins 6, Blue Jays 3: Martin Prado hit a bases-clearing double in his first game in three weeks, Wei-Yin Chen pitched eight strong innings and the Marlins beat Toronto in Miami. Published: Sept. 1, 2018, 9:48 p.m. Updated: Sept. 1, 2018, 10:14 p.m.